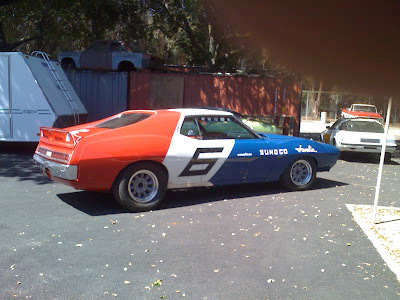 Purpose: Build a 1971 Mark Donohue Trans-Am Replica. This 72' Javelin 360 2-barrel with an automatic transmission was donated to the auto shop. We went to eBay for a fiberglass rear spoiler. Ram Air Hood came from a local swap meet. The project begins with fiberglass and body work. Removed the side markers and filled in the holes. Removed all the trim and emblems. Pulled the engine. Resealed, painted and reinstalled. Added new intake and 4-barrel carb. Tires and wheels. Took our time with tunneling the floor for a side exhaust. Installed a Chrysler 8 3/4 rear end. Swapped the stock steering wheel with a racing one. Talbot style racing mirror. Installed long wheel studs all around. Modified the shifter to look like a 4-speed. New AMX style grill off eBay. Installed hood pins and fabricated aluminum under hood panels. Blue racing style seats were donated. Back to Vector at City Collision when we decided to go ahead with the true Red, White and Blue AMC paint scheme. Once it was back to our shop, we worked on some details. Fabricated the window straps and a front spoiler. Michael Norcia cuts, trims and polishes the stainless exhaust shields.